ROCKVILLE- Betty J. Fox, 93, of Rockville, Indiana passed away at 2:44 am Sunday, March 17, 2019 at Gibson Family Center for Hospice Care in Terre Haute. She was formerly employed by Hillcraft Jewelry in Rockville and was a homemaker. She was born March 29, 1925 in Parke County, Indiana to the late Claude Adams and Madge Hennon Adams. Her husband of 56 years, James E. Fox whom she married November 6, 1943 in Rockville preceded her in death February 12, 2000. Survivors include two daughters, Barbara J. Loden of Rockville and Beverly J. Johnson of Grand Rapids, Michigan; five grandchildren, Amanda (Roger) Chapman, Meredith (Mike Fitzek) Loden, Michelle (Jerry Hayn) Loden, Erika (Ryan) Cowell and Chris Johnson and special friend Amanda Weiss; three great-granddaughters, Haley and Hayden Holcomb and Charlotte Cowell. She was preceded in death by a son, William E. “Bill” Fox on May 14, 2010; two brothers, Wendell Adams on September 8, 2015 and Wayne Adams on September 9, 2015. She was an active member of the Rockville Christian Church and the Friendship Sunday school class. She was a former member of the Order of the Eastern Star chapter 126. She was one of the founding parents in the 1960’s to help establish Parke County ARC now known as CARS that has helped many area citizens. 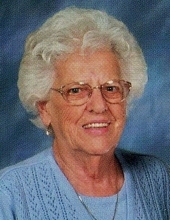 She enjoyed sewing, baking pies, family and her church. Services will be 11:00 am Thursday, March 21, at Gooch Funeral Home, 112 W. Howard Street, Rockville, with the Rev. Greg Robbins officiating. Burial will follow in Memory Garden Cemetery, Rockville. Visitation is 4-8 pm Wednesday at Gooch Funeral Home. Memorials should friends so desire, may be made to the Rockville Christian Church, 292 W. US Highway 36, Rockville, IN 47872 or Child Adult Resource Services, 201 Dormeyer Avenue, Rockville, IN 47872 in her memory. To send flowers or a remembrance gift to the family of Betty J Fox, please visit our Tribute Store. "Email Address" would like to share the life celebration of Betty J Fox. Click on the "link" to go to share a favorite memory or leave a condolence message for the family.